After 2 defeats in the opening two games of the Unai Emery era, the agenda driven and attention seekers were getting on the Spanish managers back. The majority of us, however, realised the fixture list computer had given us a nightmare start to the season – a home game against Manchester City and a visit to Stamford Bridge – and vocally backer the new man. After those two defeats, it was only those attention seekers and a few in the media attempting to create a story who tried to show Emery as a man under pressure. One leading journalist even went as far as saying Emery was “his favourite to be first manager sacked”. Three games on, and 5 games into the new season, we now sit level with Tottenham on 9 points. The 2-1 victory over Newcastle made it 2 away victories on the trot – the first time since May 2017 we had won 2 away games in a row. An average first half was changed at half-time when Emery pulled off Matteo Guendouzi, replacing him with Lucas Torreira. Every time the Uruguayan has pulled in an Arsenal shirt, the team have looked better. He now needs to start. The game was not without its heart in mouth moments as Arsenal continued to try and play out from the back. Whilst Petr Cech and the defence get a lot of the criticism, the problem is in the midfield. When the ball is with the defence, there is a lack of midfield options, resulting in the defenders having to go backwards to Cech and sit deeper. Granit Xhaka and Guendouzi rarely made themselves available in the first half to their defenders. Often finding themselves marked, they were not giving their defenders that forward option. This left the only option to go backwards towards Cech. Man City always have 2 or 3 options, and have the get out ball of playing back. When the ball goes forward into the midfield, everyone pushes up a few yards. Then when it comes back into defence everyone is further up the pitch creating more space. When those midfield options are not there, the ball goes back to Cech and suddenly you are in your own 6-yard box with opponent attackers pressing. Suddenly both Torreira and Xhaka were available to take the ball off the defence with a forward pass. The player on the ball had options. Torreira is sharp in his passing. Rarely taking two touches to release the ball. He just quickens is up – speed is important when we are playing out of the back. Guendouzi has had a decent start, but he is currently a little too slow on the ball in the Premier League. Another new signing who had a fantastic game was Sokratis. The Greek centre back was a beast on Saturday. He won everything, put in some key tackles and showed he was not as slow as some have made out. Brilliant signing. We now have a run of 4 home games in a row – 2 in the Premier League and 2 cup games. 4 wins from he 4 games has to be the minimum target. Victories over Watford and Everton in the league would leave us with 15 points from the first 7 games. That sort of form might not be enough to make you title contenders, but would keep us on course for top 4. It is early doors but you extend that form to 38 games and it would give us 81 points – which was Manchester United’s total when they finished 2nd last season. Onwards and upwards with Unai Emery’s red and white army. 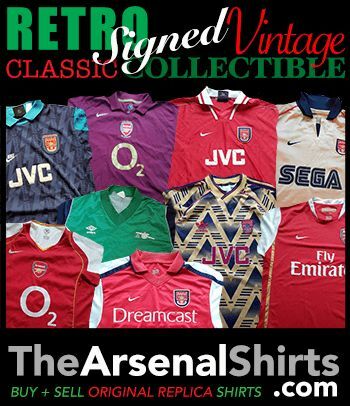 Includes Signed shirts + Retro shirts. This entry was posted in Arsenal and tagged Arsenal, Lucas Torreira, She Wore, She Wore A Yellow Ribbon, Unai Emery on September 17, 2018 by keenosafc.